Ian Williams bounced off the ropes to keep his hopes of a fifth world title alive after scraping through a tense Quarter-Final in the Monsoon Cup in Malaysia today. Meanwhile, in the bigger battle to decide the 2013 winner of the Alpari World Match Racing Tour, the 24-year-old Taylor Canfield is beginning to look like a World Champion in waiting after coming through his Quarter-Final 2-0 against Keith Swinton. 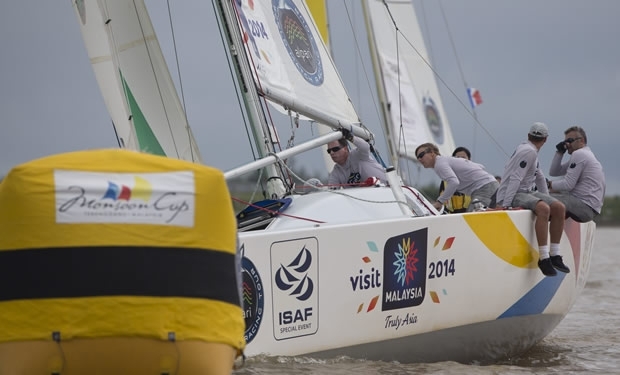 The concluding day of the Monsoon Cup will see the Semi-Finals determine which of these four teams, Canfield v Robertson and Williams v Richard, will race it out for the Finals tomorrow afternoon in Kuala Terengganu. The Finals will be televised live around the world via 18 broadcasters at 1500 to 1700 hours local time (GMT +8).